A really OLD turtle returns to Sandy Point! Taking advantage of the nice cool evenings, we’ve been patrolling with the Sandy Point Rangers ahead of our opening day, which is today! The other night we came across an incredible turtle, just before midnight on our last patrol. She looked like many of the other turtles that we find, with some scarring, parts of flippers missing but healed and doing what turtles have done for millenia – nesting. But this turtle was different. Once we checked her tags against our database list, we saw that her original tag was VI1231. 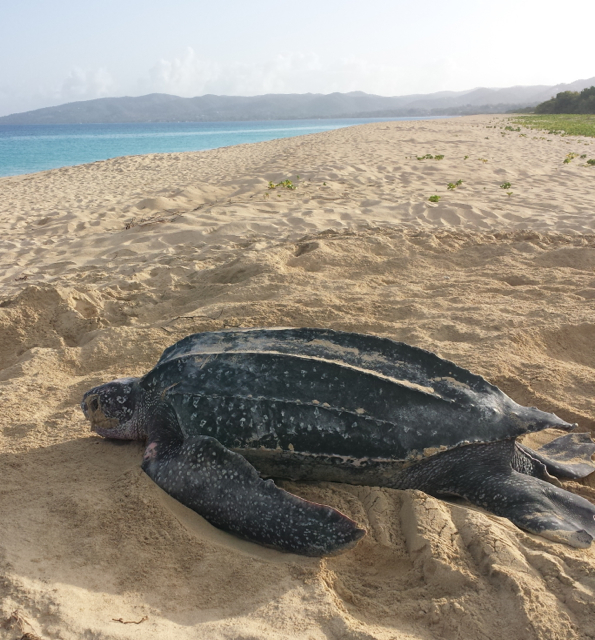 The VI series was from a long time ago – the first time this particular turtle was seen and tagged was on 1 April, 1988! That means that she has been an adult female for at least 32 nesting seasons and this may be the longest leatherback tag return on record – globally! It certainly is a record for the Sandy Point Project! This turtle (now called Caroline, adopted by Ellen Drago), has been faithfully visiting Sandy Point since 1988, laying over 70 nests in the refuge. It’s amazing to think what this turtle has been through and what she’s seen traveling the Atlantic over all this time! We should see Caroline several times this season, as the last time she was seen (in 2013), she nested eight times. She also has a consistent pattern in her nesting, with nests laid every 10 days. In many of the years she has been here, she has nested on exactly the same dates as the previous times (e.g., 3/19, 3/29, 4/9 etc.). We are thrilled to welcome Caroline (VI1231) back to Sandy Point this year! Surveying Caroline’s nest the following morning. First turtle identified at Sandy Point! Four new turtles identified and named! Amazing that she has been returning on the exact same dates numerous years!!! Talk about a biologic clock ticking!! WOW Thank you for the information.